Registration is done for all classes Nursery-XII in the school office from Dec. to March, from 8.30 am to 1.30 pm. Nursery students are screened to ensure that they are normal healthy children. Nursery admission is based on ‘First come first served’ basis. Admission from L.KG, U.KG, Class I-IX and XI is strictly on merit and subject to availability of seats. Admission to X and XII is considered under special circumstances. Nursery – 2 years 6 months as in April. L.Kg- 3 years 6 months as in April. NOTE: Please add one year to each subsequent class. NOTE: Admission is based on marks scored in Class X. Admission is based on marks scored in Class X. Apply on Registration form available from the School Office with the copy of latest marksheet from the Board of Examination from where the student took Class X Examination, along with a copy of Birth Certificate. Admission will be granted on merit and vacancies available. 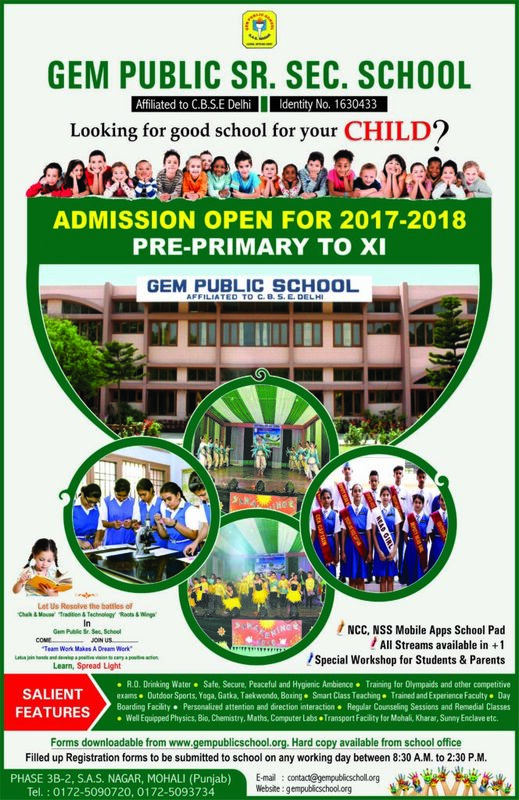 Address: Gem Public Senior Secondary school, Phase- 3B2, Mohali.